We named this collection the Ultimate Shadow Palette because that's exactly what it is-a pro-level palette packed with 16 high-performance eyeshadows in a rainbow of tone-inspired shades. Available in four striking color combinations--Neutral-Cool, Neutral-Warm, Bright and Smokey/Highlight. Each set features a vivid mix of velvety-rich textures and mesmerizing finishes. Features mattes and satins to shimmers and metallic. Additional Information : NYX Professional Makeup offers a wide range of professional makeup & beauty products in modern, new-age packaging and include a variety of highly pigmented lipsticks and glosses, eye-catching eyeshadows, eye and lip liners, base foundations, concealers, end number of palettes, brushes and much more to choose from. Explore the entire range of Eye Shadow available on Nykaa. 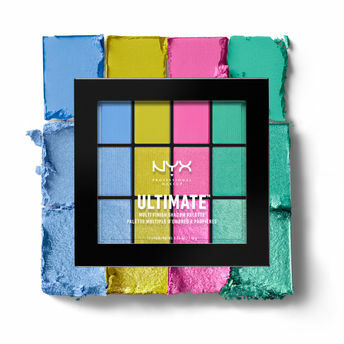 Shop more NYX Professional Makeup products here.You can browse through the complete world of NYX Professional Makeup Eye Shadow .Alternatively, you can also find many more products from the NYX Professional Makeup Ultimate Multi-Finish Shadow Palette range.